OCMC News - Incredible Updates from OCMC Missionaries! Fr. Juvenal Repass before serving the Eucharist in Guatemala. As an OCMC Missionary, Fr. Juvenal has witnessed and been a part of the Church's exponential growth in this Central American country. For the last year, Archimandrite Juvenal Repass has been serving in Aguacate, Guatemala, in the Mayan Orthodox Church under Fr. Evangelos, the local priest. Soon after arriving, Fr. Juvenal began officiating services to the 350-400 people in church on a Sunday morning in Aguacate so Fr. Evangelos could visit other parishes more often. Fr. Juvenal has exciting news from Aguacate, as The Apostle Andrew Seminary has opened. It is the first Orthodox Christian theological seminary in Central America. In addition, he reports that there are seven seminarians who study in the parish school, who live and learn about the Church. On the last day of Great Lent, fellow OCMC missionaries Jesse Brandow and Jennifer Rice arrived in Aguacate. Since their arrival, Fr. Juvenal has worked with them and with Fr. John Chakos, the OCMC mission field leader in Guatemala, on the new seminary curriculum. Every two months, catechism classes take place at the Apostolic Center facility in Huehuetenango, Guatemala. Two days of teaching are conducted for the 80 to 100 catechists who come from parishes and communities in the area, who then return to their communities and pass on the teachings. Through the months of May and June, Fr. Juvenal reports that he performed 7 marriages and 24 baptisms. He was also present when 153 people joined the Orthodox Church through Holy chrismation in Pebilpam. 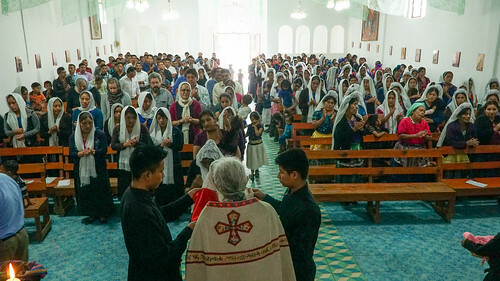 An additional 37 chrismations have been performed throughout Guatemala during Fr. Juvenal's time. Back in St. Augustine, Florida, the Colburns have been working diligently on the Liturgical Translation software, for liturgical translators to create and publish their translations of the Eastern Orthodox Christian liturgical texts in various languages. This Translation Management System (TMS) provides tools to create and publish translations. Recently, Michael’s focus has been creating a Liturgical Translator's Handbook using the Hymns of Theophany. The TMS allows the handbook creator to enter analyses of the original Greek text (its morphology and syntax), explain the meaning of the text, describe translation issues, and offer potential solutions. By this summer it should be available for general use. The Orthodox Christian Mission Center hopes that you will join in prayerfully supporting the Colburns, and pray that testing of both the TMS and Translator's Handbook goes well. We also ask for prayers for Fr. Juvenal throughout his missionary service and for his success in the task of learning the Spanish language. For more information, or to inquire about serving as a long-term missionary yourself, please contact the OCMC Missionary Department by phone at 904-829-5132 ext. 121, e-mail us at missionaries@ocmc.org, or visit OCMC online at www.ocmc.org.